Data about data, that’s got to be pretty interesting right? Well, it turns out to be more interesting than you might think. But first lets get the definition under control: Metadata is data about other data – that’s where its value lies, but the metadata is only of value if you have a use for it, and the same could be said of the data itself. More than likely like me you are constantly generating new material – be it photos, sounds, video, music, text or whatever. All that data is getting stored and, in the present tense, we know what that data is and its relative importance. But time passes, memories blurr and data soon becomes lost in the archive constantly growing in parallel to your life. And thats where metadata can help! While most people probably don’t worry too much about ever setting it up, metadata is crucial in the process of film making. For example the location sound recordist must be very, very sure his file naming & metadata are correct because his media is inherited by a lot of people & is accessed repeatedly for many months, long after he is off the payroll & has archived his work. For sound effects editors and sound designers, one of the most important assets you own is your own personal sound library and it is this application of metadata I’m going to discuss, as it represents a means of including far more descriptive information than is possible with just the filename, and it can have a major impact on the accessibility & useability of your library. But it is not as straight forward as perhaps it should be, since as with many technical developments we meet the clash of open source versus proprietry systems. The first issue is what applications support metadata? With ProTools you can display and edit metadata in the workspace browser. Open it via Window menu > Browsers > Workspace and open one of your drives with sound files on it & see what metadata already exists in your files. You can see from this example that it easily gives you the ability to tag the file with more descriptive terms than is used in the file name, so eg as below if I searched for ‘chomp’ in filename alone I would get zero results, whereas searching filename & metadata would find the file…. 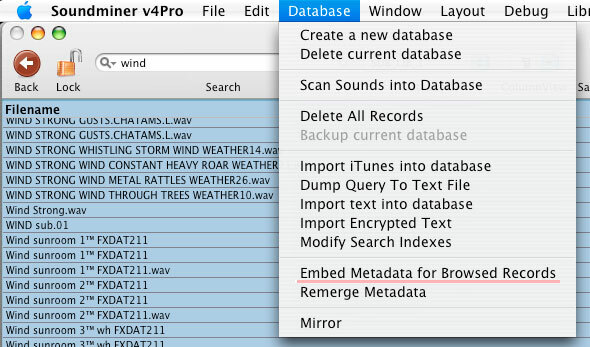 Now this is an example of metadata stored within the source file itself & it is not the only way; the other option is to store metadata in a seperate database, and some apps give you the choice of both scenarios eg the sound library application SoundMiner allows you to tag additional descriptive terms to any file & by default these added terms are stored in SoundMiners own database file. But the danger here is what happens if that database file is lost or becomes corrupt? Once you have spent the time entering metadata, it is so important that there is no way you ever want to risk losing it, so apart from regularly backing up your SoundMiner databases I also believe you should export your metadata into the source files themselves. If you have ever used a nice, user friendly database app like FileMaker Pro you will know that you can keep adding fields to the database to your hearts content, but does the same apply to metadata? Well… yes and no… And here’s where we need to do some research into the actual format of metadata and how it is embedded into your soundfiles. In terms of digital audio files, first there was the .WAV audio format which stores audio data in a straightforward linear fashion. But as software and hardware has evolved we’ve seen the evolution to the BWF (Broadcast Wave Format). Whats the difference? Basically a BWF file is a .WAV audio file that also contains an extra data “chunk” to carry information about the content, you guessed it metadata. Now the great thing with this extra chunk of data is that if your software or hardware device has no use for the metadata then it ignores it and treats it like a normal .WAV file. So what sort of data can we add? And more importantly, is it standardised? So for example a production recordist on a film shoot enters the slate & take number every time he rolls sound, and that information is embedded into the .WAV files, which are delivered to picture editorial who load it into their AVID or whatever. Months later a dialogue editor inherits the work of the picture editor (as well as all of the material recorded) and in ProTools he can verify from metadata the slate and take of any piece of audio because of iXML. As you can imagine it has been a herculean task to get all of the manufacturers of sound recording hardware (along with the DAW developers) to agree to a standard, but it has been achieved! 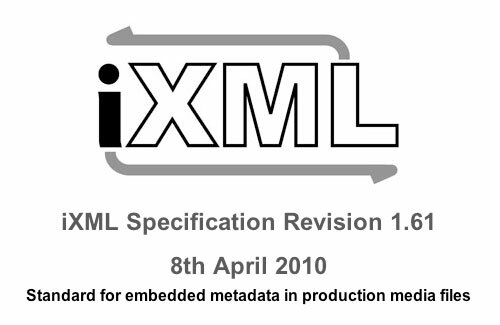 For more info on the iXML spec check wikipedia and the official support site. So for the workflow of [shoot -> picture editorial -> sound editorial] metadata works, with the caveat that nothing is presumed and camera/workflow tests are ALWAYS done before the shoot to verify this fact. So now lets presume you are doing something similar to me ie recording wild ambiences & FX, editing & mastering them and then adding them to your sound library. What’s the best way to integrate metadata in that scenario? About now is the point where use of the word standards starts to get a little shakey. It seems anyone can create an app that adds metadata to a .WAV file, the issue then becomes who can read it? Now I’ve used ProTools as my primary sound editing DAW for the last 18 years so whatever metadata I embed I want it to be readable by ProTools. But over the years I’ve tried & used many different solutions for managing my sound library and at the moment SoundMiner is my app of choice. Now I’m pretty sure I’ll still be using ProTools 5 years from now, but SoundMiner? I’m not so sure… It does a great job but I have also investigated a number of other options and I’m not 100% convinced that give or take a year or two of development I may well end up switching to a different sound library app. With this knowledge the idea of proprietry metadata becomes a significant issue: why invest time & energy adding metadata that can’t be read by other apps, should I eventually migrate? So what metadata do I add via SoundMiner? Now some of these fields I know are particular to SoundMiner eg the ability to tag the Designers name, and embed an image. So if you own SoundMiner and embed all of this metadata, and then are working from your laptop using AudioFinder, that Designer and Image metadata will not be available to you. And there lies the quandry of the world we live: commercial imperatives vs practical long term use. Its worth having a read of a white paper that the SoundMIner developers published in the name of establishing and encouraging sound library developers to include their implementation of metadata. In an effort to be fair and balanced I shall send a link to the developers of each of the sound library application creators and ask for their comments about metadata support. So aside from the ProTools workplace how else can we get metadata into our files? Ok so thats my metadata rant for now, tomorrow I am going to send an email to each company that sells a sound library app, and ask for a specific explanation of their metadata implementation and support. I shall report back! – do you inject metadata into your sound library files? – what sound library app/s do you use? 21 Responses to You and your Metadata…. I use Audiofinder for some years now and ProTools as my main DAW. Because of the reasons you described, I always wanted to be the filenames itself as descriptive as possible. Those names are independent from any application on my harddrive. So I tried to avoid proprietary metadata although I could see the benefits which friends had who used soundminer. For me I remember files best because of the project I recorded or created them for. For that reason I put them into folders named after the project. Apart from that I can recommend the application called samplemanager by audiofile engineering (http://www.audiofile-engineering.com/samplemanager/), with which one can edit metadata but lots of more useful things like batch processing, batch renaming (also by using text-files) etc. Thanks for this post Tim! I have not been using metadata too much so far but as I have recently acquired my Sound Devices 744 recorder and my library is starting to grow I think it is time to start adding metadata to all my files! AS a ProTools user I think I will be using the Workspace browser for the moment (until I decide t buy another piece of software). The only other software I use for sound recording/editing is WaveAgent by Sound Devices. So I have one question. Metadata is inserted in the notes region in Waveagent. Now how compatible is that with other software? Does it show uop as descriptions in ProTools and how about other software? Nice post! In regards to the Doors project, which field(s) should be filled out in Wave Agent so as to conform to Protools Workspace metadata? In other words, what does the PT “FILE COMMENT” field correspond to in Wave Agent? Is it the “NOTES” field? Hmmm… none of the info I put in the Wave Agent “NOTES” field shows up in the Sound Forge “Summary” dialogue, which is where that app puts metadata. I use AudioFinder. It’s a very nice tool. I has a lot of nice features for library management and also audio editing/processing utilities (editing tools, processes, AU/VST support, etc). I don’t edit too much inside it. I mostly use it just for search and spot to Pro Tools. For that, metadata description/comment works fine. Anyway, for just basic metadata description, there are lots of compatible applications, but for “heavy” metadata injecting (more fields) I think the winner would be Soundminer. Btw, there’s another app called TwistedWave that support Soundminer metadata. I don’t tried it yet, but I’ll give a chance. I’m looking forward for the responses of the different developers and their thoughts on metadata. Great article found this through googling about the apps. Here’s my $.2. i got some download royalties on the net. I have this massive sample library on two hard drives and I didn’t have any idea what was on them. So, I got SoundMiner and spent most of my royalty check. I thought, this would be my answer to kick out tunes for download faster. It wasn’t the really useful to me, it seems really geared for another audience. I have some money left over and tried Snapper. Aside from following Finder around, it had nothing to help me organize my sounds. I tried AudioFinder. It did the job. It’s not perfect though, but of the three it did about as much as I needed. I’ve post on my blog some screen shots of Twisted Wave to show the available fields. I only use description field. Not as a technique, no, but very few items of software supported this (remember I’m coming from the organizer -> player point-of-view, not audio production). I’m seeing this more and more now.